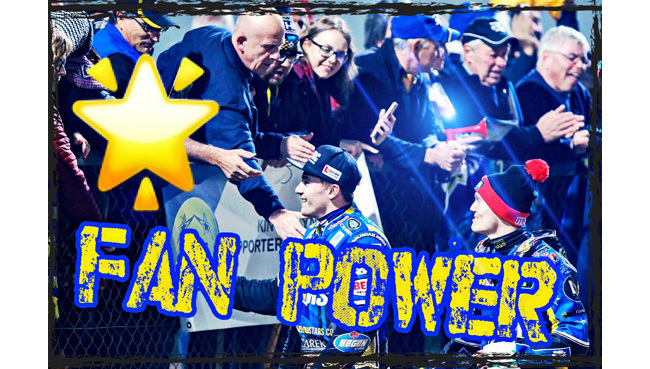 KING’S LYNN Stars will continue to enjoy fan backing into the 2019 season with the support of the club’s official Supporters Club. The organisation is widely regarded as one of the finest and most successful in the sport throughout the UK as they spread the word about the Stars at every opportunity. WE would like to take this opportunity to thank our many members, the Stars management, our riders, the Adrian Flux Arena staff and media friends for their support throughout the 2018 season. Our second full year running the King's Lynn Stars Supporters Club has been enjoyable and rewarding albeit time consuming. Our Committee of Theresa Carman, Jo Trueman, Lorna Bramble, Jamie Medler and Tracey Wilson have worked tirelessly throughout the season to add to the Stars' fans enjoyment on race nights, travel to away meetings, updating our social media platforms, organisation of the End of Season Party and Presentation Night and recently our first, entertaining Rider Night, upholding our constitution; 'By the Fans for the Fans'. The Stars enjoyed a very successful 2018 campaign, it was a combined effort between all parties and it was a great feeling up until the last few meetings of course. If we want continued success we have to work together, we are all on the same side and it's a knock on effect where each component needs to be thriving. KLSSC will carry on in the same vein for the 2019 season with a few tweaks and updates so if you would like to become a member with all the perks that it brings please find us on the usual social media platforms @klssclub or contact Theresa on 07766768359. For the 2019 season, members will receive a KLSSC printed lanyard, pen, inside car sticker, membership card, birthday and christmas cards, a chance to choose their Rider of the Night if selected at random and a chance to watch a race from the centre, amongst other things, our young members will receive a slightly different package, to be confirmed. As fans, let's all look forward to the 2019 season, with passion for our clubs, to cheering on our team riders as they race wheel to wheel in one of the most exciting sports on the planet; 4 riders at the starting tapes on motorbikes with 500cc engines, no brakes, clutch start, 0-60 faster than an F1 car, round the four corners of boarded, dirt tracks, paid by the points they score basically! They make it look so easy, it's NOT! Finally, we have one of the most exciting young riders in the world racing at King's Lynn, hailing from the county of Norfolk, Robert Lambert, if for no other reason you attend King's Lynn Speedway in 2019, go to watch his talent on a speedway bike, you won't be disappointed!